I spotted a dimple under a bank. Probably another leaf, or something falling from the overhanging branches or nettles. 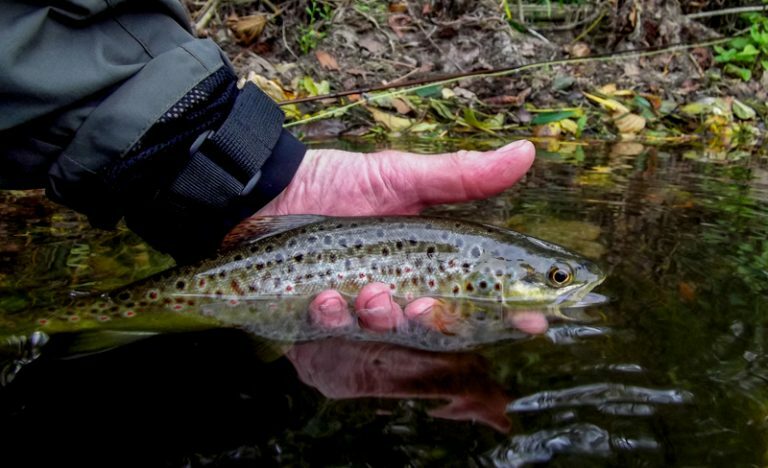 The afternoon had not been productive, and although I had seen plenty of fish, they had been unapproachable with the river so low and clear here. Then it happened again. Definitely a fish, and it was busy taking something. By kneeling in the margin I thought I might just about cover it with a flick. Up went my nymph and a beautiful little wild trout snatched it immediately and went crazy, leaping into the air several times before eventually slipping into the waiting net. Sometimes one is enough.